Well, it’s been a rad winter in Tahoe (finally), but my documentation of our adventures has kind of fallen through the cracks. However, this one was definitely worth a short write up. A few weeks ago, we had the pleasure of going with a group up to interior British Columbia to stay at the Bill Putnam Hut (Fairy Meadow) outside of Golden, BC. We flew to Calgary and drove from Calgary to Golden. The drive takes you right through Banff and it’s definitely a drive worth doing. Since we couldn’t spend any time there, a return to Banff will be absolutely necessary in the future. It really looks like one of the most beautiful places on Earth with incredible hiking and climbing opportunities. 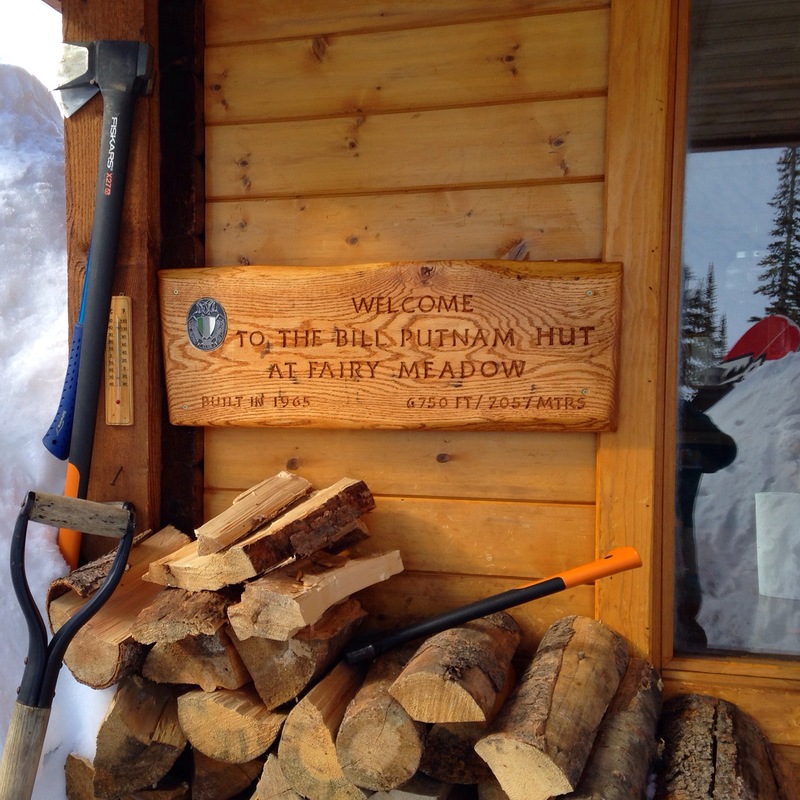 The Bill Putnam hut is a backcountry hut in the Adamant Range of the Selkirk Mountains. It is surrounded by high alpine peaks and glaciers. There is no cell service or electricity, but there are gas powered lights, oven, stove, etc. It can sleep 20 people, so 20 of our closest ski buddies gathered in Golden on Saturday ready to be shuttled to the hut via heli. Once we arrived, one group began cooking dinner while the rest of us scurried off to squeeze in a late afternoon tour. We dug some hasty avalanche pits and discussed our concerns. 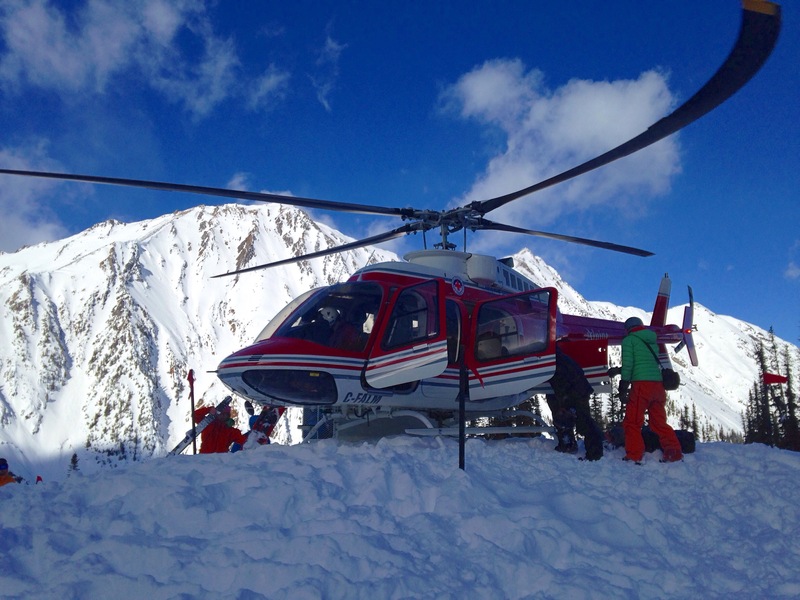 There had been a lot of snowfall recently, and significant avalanche activity nearby including one that killed a snowmobiler and injured another, and a separate avalanche that injured 6 out of 13 skiers. Yikes. While skinning that afternoon, a wind slab avalanche was triggered by one of the splitboarders in our party. While it did take him for a ride, fortunately he was not buried or injured. One other skier was also taken down but was able to arrest himself after falling about ~10 ft. Needless to say, this was enough to shake us all up significantly. It probably also lead to us airing on the side of caution throughout the rest of the week. What followed was a week of the most incredibly snowboarding conditions of my life. There was a significant amount of new snowfall everyday, enough snow to essentially fill in our tracks from the day before. It was cold, so the snow was pretty close to perfect. Given all of the new snow and the poor visibility, we ended up having to stay in the trees for most of the trip, which were down the valley from the hut. While it would have been amazing to do some high alpine mountaineering, I will certainly not complain about riding fresh pow everyday. The tree runs were also incredibly dreamy, filled with pillow lines and fun terrain. We managed to get one afternoon of sun in between storms, which provided for some good photos. The accommodations were fantastic. The hut is equipped with an excellent large kitchen, perfect for cooking for large groups. There were a lot of games, guidebooks, and maps, but the maps were not great – I’d really recommend bringing your own). The sleeping room was one large room (with the exception of a small closet where two people slept). I imagined that this would provide for horrible sleeping conditions but it wasn’t as bad as expected (bring earplugs!). The hut also has a nice sauna which allows for people to get in some sort of a shower. We divided up into teams with each team cooking one dinner and one breakfast (and cleaning up) for the entire group. This system worked really well and for most of the trip, you essentially get to be waited on. Our crew cooked up a wide variety of meals, everything from lamb to lasagna to curry. Sandwich supplies were provided by one group member for lunches, and everyone supplemented with their own snacks of course. It’s shocking how many calories you can burn when you are lapping tree runs. Most nights were spent drinking heavily and eating as much as possible to refuel for the next day; however, there was also some pretty serious board game action as well as an epic battle with the local pine marten who was constantly trying to steal food from the outdoor food storage bins. The day it probably snowed the most was the day we were scheduled to leave… Don’t get me wrong, I had the BEST time, but I was ready to go by the end of day eight. There was a good chance we were going to have to spend a booze-less night together and there was a bit of tension as we waited for the heli. Not to mention the fact that we had cleaned the entire hut and everyone had packed everything up, so to learn that we were in for another night would have been pretty frustrating. Visibility was extremely poor until mid afternoon when there were a few quick breaks in the clouds. Soon enough, we heard the beautiful sound of the heli and we were swept back to Golden. We decided to venture up for a quick peak into the alpine terrain on only one day, and we didn’t get too far before poor visibility drove us back down to the trees. All in all, this trip is an absolute must for anyone into backcountry skiing and mountaineering. I really hope we get to return one day to do more exploring in the alpine of this area. However, I feel like this hut provides a great variety of terrain for all conditions.